If you're looking for some good, but inexpensive wine, I want to give a a tipe on two cheap and cheerful wine picks that I recently discovered at the BlogHer conference. First up, Flip Flop Wine. I've seen the bottles on grocery store shelves everywhere from Harris Teeter in North Carolina to Vons in California. Everytime I see it on the shelf, with the approximately $5.00 to $7.00 price tag, I wonder, could it possibly be any good? Well, I am here to answer my own rhetorical question with a resounding YES. It's really good, especially the Pinot Noir (their Cab is also excellent if you like a rich Cabernet Sauvignon.) The Flip Flop Pinot Noir is my pick for best cheap and cheerful Pinot Noir. Like Miles in the movie Sideways, I am always on a quest for the perfect Pinot. Flip Flop's Pinots is a medium bodied wine, not too heavy with just the right hint of cherry. Flip Flop also makes a good Chardonnay and an award-winning Moscato, which is a sweet wine. You can actually do a virtual tasting on it via their YouTube channel with their Vintner David Georges. Because this wine is sweet, it might go well with spicy dishes like Chipolte or Thai green or red curry. The sweetness of the Moscato provides a cooling to the spicy flavors. Pictured: Cameron Hughes wines featured in the Wall Street Journal, good wines under $25.00 per bottle. My other tip is Cameron Hughes wine. I've written about Cameron and loved his wines since 2009 when he proposed a Wine economic stimulus package to coincide with the Fed's program. I thought it was a good idea, and I still do, especially considering the prices on Cameron Hughes. Cameron Hughes wine is behind many a privately labeled and more expensive wine from Sonoma County. I am sworn to secrecy on the specifics, but it's true. Look for Cameron Hughes at some grocery stores, online at CHwine and at CostCo. 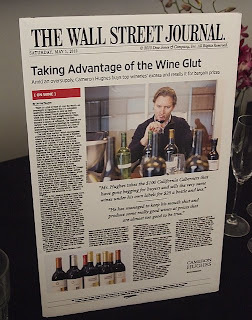 At BlogHer , I attended a special Wine Tasting for Cameron Hughes hosted by blogger Romy Raves. We sampled six wines from CHwines and these are my personal top picks. We tried the Lot 228 2010 Moscato D’Asti, Italy, but that was a sweeter wine for enjoying with deserts. Below are the wines I would enjoy with a meal or some BBQ. Their Chardonnay is a nice light summer wine which compliments the delicious seafood it was served with it at the BlogHer Party courtesy of our friends at McCormick and Schmicks restaurant in the Omini Hotel San Diego, CA. When you look for Cameron Hughes, make sure to look for the specific lot number and year that I am recommending here. Not all wines are created equal. My personal favorite was the 236- 2007 Clear Lake Syrah, winner of the San Diego Wine International Gold Medal. With it's notes of Blueberry it's delicious alongside lamb, beef or even seafood. At the McCormick and Schmicks tasting it was served with some delicious lamb chops, that were to die for.